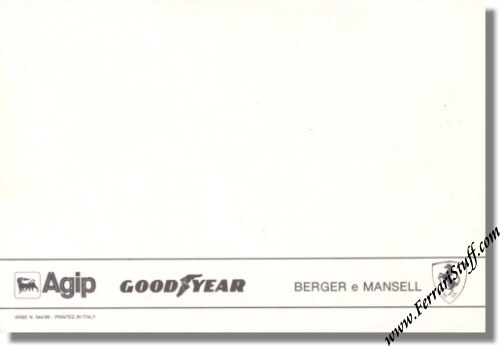 Ferrari Factory Postcard Gerhard Berger and Nigel Mansell. 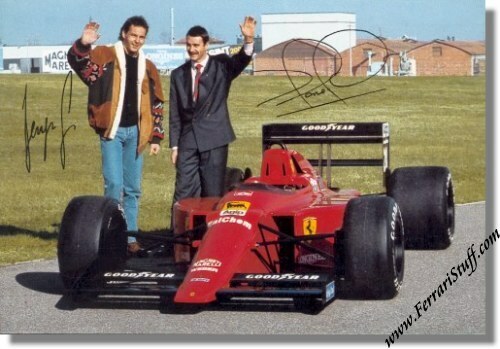 It shows Gerhard and Nigel behind the Ferrari F1-89 + printed signatures. The back side shows Agip, Goodyear and Scuderia Ferrari logos. It measures approximately 6 x 4 inches or 15 x 10 cm (normal postcard size). Ferrari Print Number 544/89, issued in 1989, printed by ARBE, Italy.